In EFT, we often talk about people as generally falling into one of two categories when they're feeling disconnected — withdrawers (those who shut down and pull back) and pursuers (those who criticize and, you guessed it, blame). That said, all of us have at times used blame as a way to "discharge pain" rather than finding the vulnerability to share hurt feelings or facing the fear of being out of control. Brene Brown's latest video talks a bit about her own experiences with blaming and how dropping coffee on yourself in the kitchen is always your partner's fault. 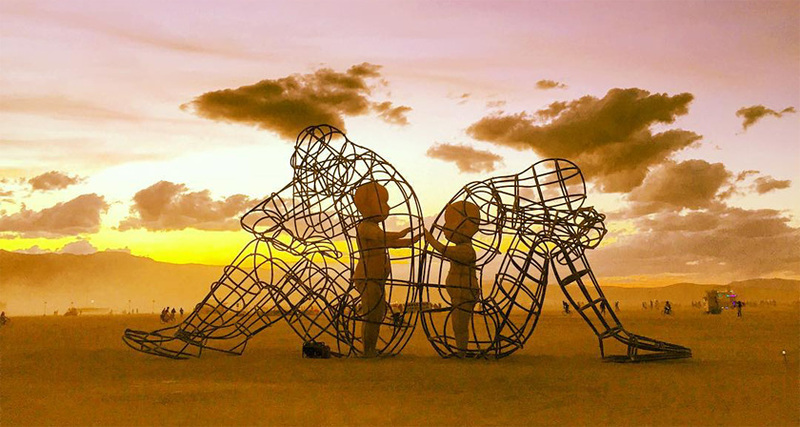 LOVE is a sculpture by Alexandr Milov that was displayed at the Burning Man festival. According to Milov, "It demonstrates a conflict between a man and a woman as well as the outer and inner expression of human nature. The figures of the protagonists are made in the form of big metal cages, where their inner selves are held captivate. Their inner selves are executed in the form of transparent children, who are holding out their hands through the grating. As it’s getting dark (night falls) the children start to shine. This shining is a symbol of purity and sincerity that brings people together and gives a chance of making up when the dark time arrives." This is one of my all-time favorite images. It captures our innate, inborn (literally "wired-in" in this image) longing for connection and depicts the cages our defenses can represent. It's also a perfect encapsulation of what we strive to do in therapy: help the vulnerable parts of us make direct and clear contact with a safe and loving other rather than turning away in pain. One of my clients just shared this awesome TED talk with me from Johann Hari, explaining that addiction is not so much a chemical reaction as it is a desperate attempt to escape from profound isolation. He shares several fascinating studies from the lab and from the real world to build the case that "the opposite of addiction is not sobriety…it's connection." This clip explores the toxic pressures on men to hide their feelings and how we (still!!) give boys and men the sense that they must be completely invulnerable in order to be masculine. This seems to be a key reason so many men shut down and withdraw with their partners, out of the fear that they'll be seen as weak or unattractive if they share their vulnerable feelings and needs with their loved ones. A couple therapy client of mine just shared this awesome video, sharing a place we so often get stuck as couples — "just listen to me, don't try to fix it!" — with a pretty hilarious twist. "Joy becomes foreboding—something good happens and we become compelled to beat vulnerability to the punch." "Disappointment becomes a lifestyle…it's easier to live disappointed than to feel disappointed." And, of course, we numb out. But as Brene reminds us, "you cannot selectively numb emotion." Numbing our pain and fear also means numbing the joy, love, safety, happiness, pride, and closeness that we could be feeling…and without that, we lose all the good things that can help us hang on through the hard times, all the things that make life meaningful. It is often hard for withdrawers to see how disengaging and shutting down can be so hurtful to their partners. Compared to the angry protests of pursuers, it can seem like a small thing to go quiet and turn away. This wonderful new video from attachment researchers Sue Johnson and Ed Tronick really clearly depicts how that seemingly small move can be quite devastating to the person on the receiving end of that withdrawal. Dr. Tronick first shares an example of how a mother failing to respond to her baby for just a few minutes (the still face experiment) causes the baby to despair and protest. Next, in a lovely demonstration of how our adult love relationships parallel the parent-child bond, Dr. Johnson's couple session shows the exact same scenario playing out with a husband and wife. Feeling anxious, the husband (the withdrawer in this relationship) shuts down and fails to respond to his wife's bids for reconnection. As she feels more and more panicked and abandoned, she escalates and protests — just like the distressed child — trying to get back into sync with him. I assisted the awesome Jennifer Olden with one of her Hold Me Tight couples' workshops this weekend, and she shared this really wonderful video from Brene Brown on empathy. Although research continues to tell us how incredibly important empathy is to successful relationships, many of us have struggled to define what exactly empathy IS. According to Brene, empathy has four qualities: perspective taking, staying out of judgment, recognizing emotion in others and then communicating that. "Empathy is feeling WITH people." Someone's in a deep hole, and you say, "hey, I know what it's like down here and you're not alone." An important lesson for all of is that you can't really stop someone's suffering, but you can make sure they don't suffer alone. Empathy, she says, is vulnerable because "in order to connect with you, I have to connect with something in myself that knows that feeling." She also emphasizes how your empathic presence is the antidote to your loved one's emotional pain vs. trying to come up with a solution. "Rarely can a response make something better—what makes something better is connection." Check out the clip and learn more about the awesome power of empathy…while watching a judgmental antelope eating a sandwich.